I just bought my Aspen Classic camper a month ago. When I bought it I noticed that the tongue appeared to rise slightly from the rest of the frame But not having a lot of experience, I just assumed it was normal. I finally got a chance to use it for the week long Sat-Sat trip to NASSIR, camping on the way down and the way back. I noticed that on the start of the trip, I was getting quite a bit of swaying at highway speeds and pulled over after about 30 miles. Parman who was riding with me with his Aspen Classic suggested that I rebalance the load and helped me to decide where to rearrange stuff. I was also traveling with a bunch of gatorade and water bottles iced down in the cooler and this may have been a factor but I also have the continental kit on the back. After rearranging, it did help but I still got swaying when traveling at 70mph+. Parman's tracked smooth the whole trip. 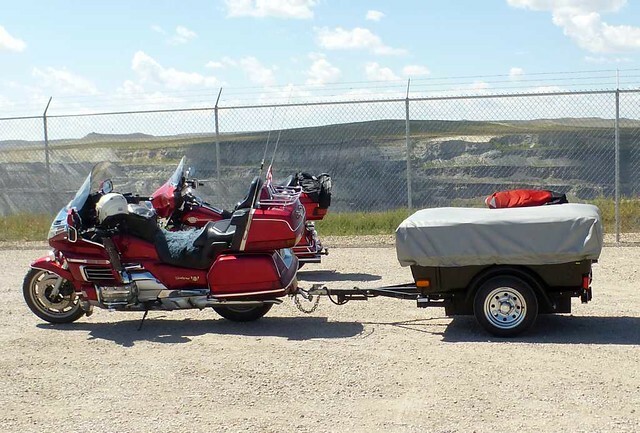 After Simpsonville KY, we met up with Erwjww who rode behind us also with his Aspen Classic. He also noticed the trailer was a bit squirrely. The next day after camping and hooking the trailers back up, I took a look at both of their setups and noticed that their tongues and "A" frame in front of the tub ran perfectly straight and inline with the rest of the trailer frame. I pointed it out to them and they both saw the same thing I did. I used both of their knowledge to get the tub packed and evened out but continued to have a bit of swaying especially in the curves. Once down in NASSIR, I ran into Jobe05 who is also an Aspen Classic owner and asked his opinion. He also agreed that the tongue appears to bend upwards. The wierd thing that everyone agrees on is that the frame does not appear to be creased in any way. There also does not appear to be any cracked paint that usually is evident at damaged spots. Here are a few photos but not sure if they will clearly show what is going on. Pardon the clutter. I talked to each about their thoughts on what to do. Parman suggested maybe looking into a new frame but I would rather not do this as the new frame will come with a new VIN and then I would have to transfer and pay additional fees to change the title and registration. Erwjww suggested maybe secureing the frame and getting the front pulled back down. Jobe05 agreed that something should be done to take care of it. I had thought about bringing it to a body shop to see what could be done to get it straightened but am worried about weaking the frame and the cost to get it done. If body shop would be a decent option, would it be best to leave the whole trailer together or remove the tub? From what I can see, it would be pretty straightforward to remove the lights and unbolt the tub from the frame. When I bought this, it had a swivel wheeled jackstand but it was falling apart. I picked up a new one from Harbor Freight and swapped it out. 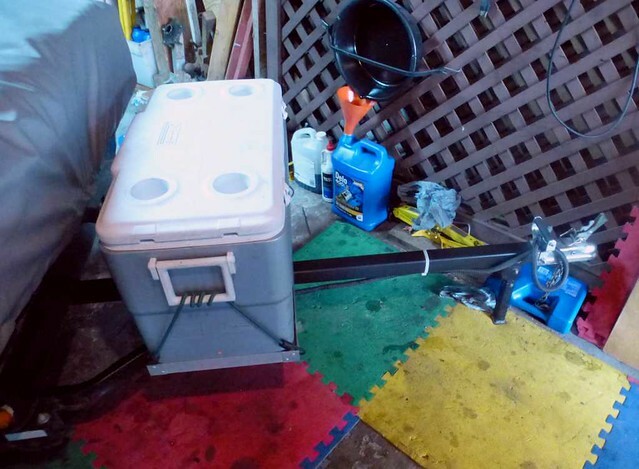 I thought that maybe the jack stand contributed but I have seen a few others that have the stabilizer jack stands similar to the 4 frame jack stands and they don't have this issue. My setup right now is a 3" drop Rivco hitch and the trailer looks fairly level but I think that is because of the tongue and frame rise. 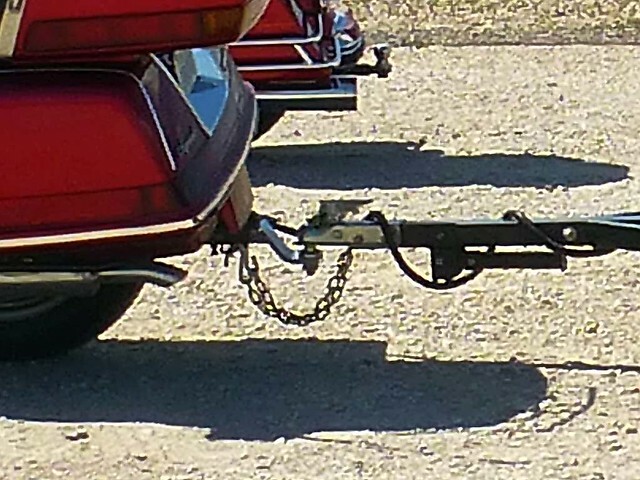 I have seen that others have been using the 6" drop for these style trailers. The 6" would be about the same as the popular GL1800 hitches that come out from under the rear fender and that seems about right. However, the way the tongue is right now, I am pretty sure that the Aspen will have a dramatic lean forwards with a Rivco 6" drop and that could be a problem. Erwjww suggested either switching out the hitch or getting the tongue fixed but not both and see if there is any improvement. On that I would have to agree. So I already have a few suggestions but I want to get as many opinions as I can get and thoughts about the best way to get this fixed. I know that aspenmann is a member here and maybe he will pop in with some ideas. I know he is supposed to be at the NAGF ILL M&G coming up in less than 2 weeks and can show him what is going on. I will probably have to wait until early spring before I will be able to get anything done. 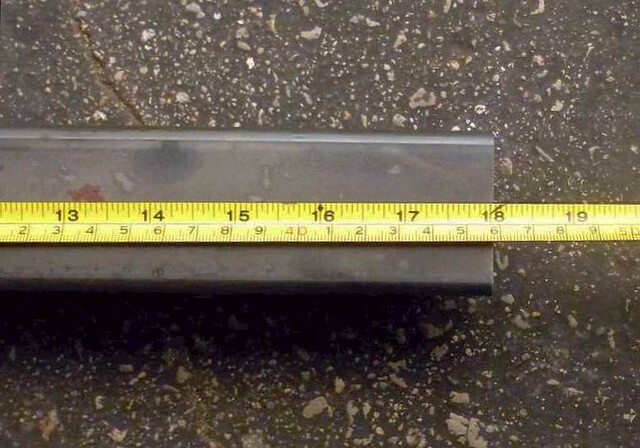 It does indeed appear to be 'sagging' a good 2" at the coupler. When I got my Sentry, I was getting sway as well around 18 wheelers. 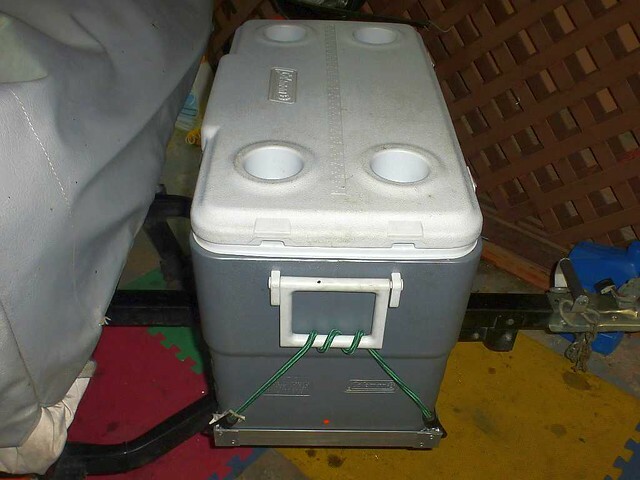 I thought maybe it was the way I had it loaded, so I shifted the cargo inside around, which helped some, but my tongue weight was more than 65 lbs!! 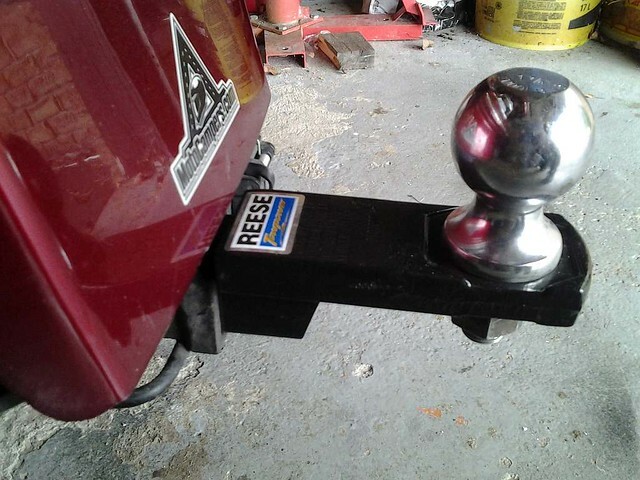 Since the Aspen Sentry has 12" wheels and sits higher than my cargo trailer with it's 8" wheels, I bought a new straight ball mount ($12), so the Sentry would sit more level when hooked up to my 1500 as the one that came with the Show Chrome receiver hitch had a 3" drop (works great with my cargo trailer) but, that didn't help much at all!! My fix was to lengthen the Sentry's tongue by 18". 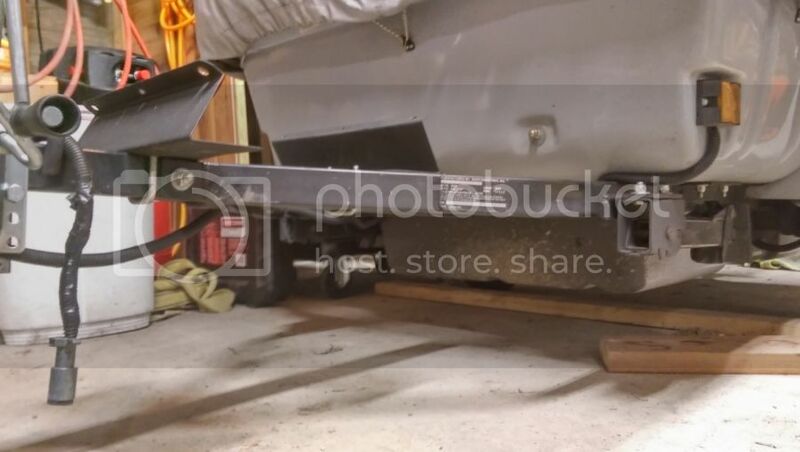 I visited a nearby welding shop and bought a 5'/60" length of 2" square tubing ($20) and drilled the appropriate holes where needed, bolted everything back up and the trailer sway disappeared, even with a tongue weight of just 29 lbs! You need to check the rest of the frame. If the front is bent up, the rest may not be square. The wheels may be too far off parallel. I too had a major problem with sway w/ a CT and a slight sway w/ a MT (@ 55-60mph). About two months ago, I had an extended tongue installed on the trailer & the MT sway is gone. Yesterday I reinstalled my CT on the bike & the first test with the trailer at 72mph was fairly stable. I will test it again this coming weekend to make sure it pulls fine before I head to Clinton Lakes. Back when I was involved in racing, I seen many homemade trailers that pulled just fine and I know that most of them was far from perfect. Even though your frame is bent, I do not believe that it is the main cause of your sway, as my money is on the short tongue that the Aspen stock trailers come with. Carl, a tongue that is solid, meaning you cannot work it around with looseness, should have absolutely no problem with an upward slant. 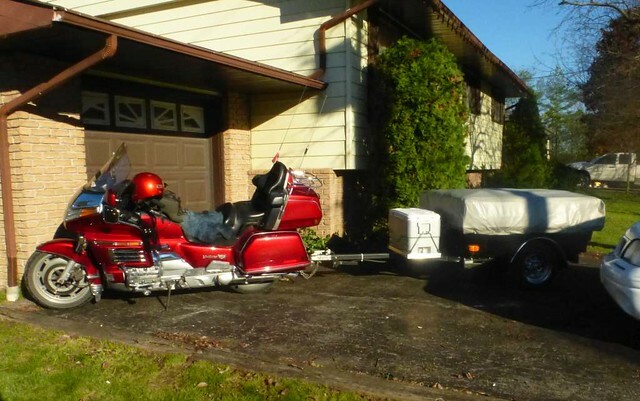 The main factor on pulling a trailer is weight balance. We hauled the monkey truck around in a single axle 8x12 box trailer and it pulled hard and not very nicely. After breaking the torsion style axle I installed a pair of mobile home axles narrowed to fit the trailer. I moved them back so the weight on the tongue was a little more. It pulled easier and much better. So my thought is that as Dusty said and after my 12,000+ miles pulling the Aspen Classic that we ordered with the long tongue you could cure two things at once with a new longer tongue. 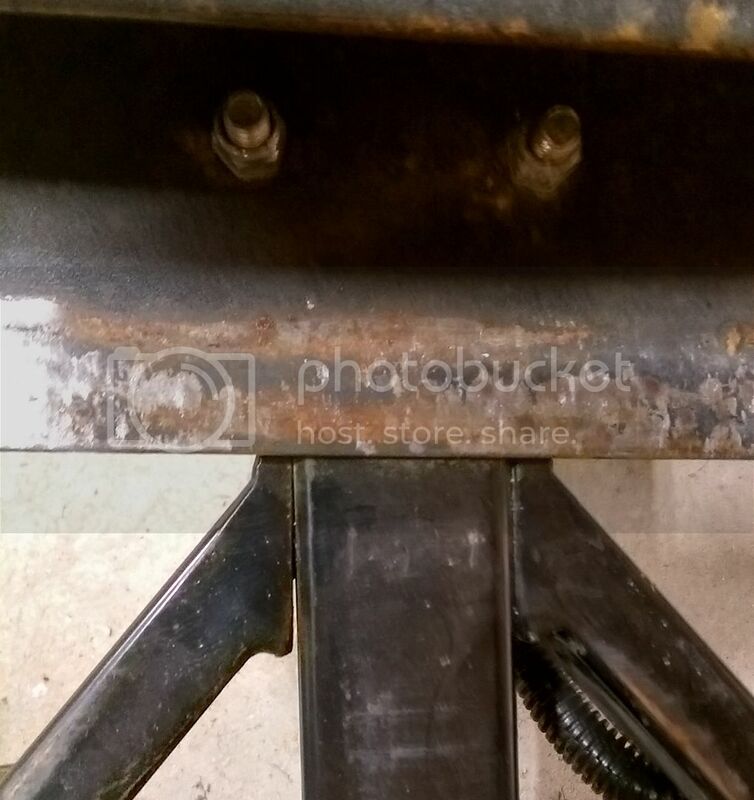 Any welding shop could fix that and at the same time make the frame and tongue be in the same plane. As far as the trailer ID thing. Just cut it loose and apply it to the new setup, tongues get bent frequently and repaired. Just document it and not worry about it. I believe in one rule. If you are not doing anything stupid you are not going to be stopped and checked. Another fix would to be put the front jacks down, have someone heavy bounce on the tongue to persuade it to come back down. Might have to get some weight in the back to help hold it down. I am sure several of us at IL M&G could do the tweak for you. One last possible fix. Unbolt the tongue and turn it over if it is the tube bent. If it is the body tubes that come around the applying pressure down on the tongue should pull them back into shape. Go for the long tongue thing. you will never regret it. It does make your whole rig about 22' long but you can still pull it into a car parking spot without hanging out into traffic. If the tongue is indeed bent, and it looks like it is, I would suspect it took one heck of a lot to do that, those are boxed frames and they do not bend easily. I would be concerned it there is something else that may be not quite right with the trailer, possible axel or axel mount damage as well. Looking at the photo looking down on th A frane, I see an uneven gap between the 2 pieces on the left. That would be a concern as well. That seam looks loose and it could be allowing movement that translates to the weaving of the trailer at road speed. Taking the tub off and taking the frame to a body shop that has good frame machine would likely get it straightened out but I have no idea of the cost for something like that. I towed my Aspen Classic without a tongue extension and I know of many others who also tow without an extension with no weaving problem. Were it me, I would prefer to get the trailer looked at to be sure the frame is all good and check the axel and wheels also. That thing sure looks tweaked to me. I might just think about trying to beef mine up. I do carry a lot more weight than it is designed for and I suspect that excessive weight and maybe some rough roads could cause that. As for fixing yours, I don't have an answer. I did hear back from original owner yesterday and confirmed what I thought. We chatted for quite a bit and I am satisfied with his explaination and dont believe he was trying to hide anything. He just did mostly local trips that didnt involve high speed traveling and thats mostly where the wagging shows up. I do like the longer tongue idea mentioned by Dusty,Monkeytrucker and Galaxyhunter. It is only about a $20 investment so it couldn't hurt. DougW, I also agree that the whole frame probably needs a good going over but I will try the tongue changeout first. I figure that capn't hurt and the cost is minimal. Thank you to everyone for the additional ideas. I hope that works out for you Mike. Thats a quick and cheap fix if thats the issue. Good luck. I suspect the longer tongue will solve your issues. Yes .... I forgot to mention my new tongue was 1/8" wall thickness. It only took me ~ 25 minutes to unbolt the old tongue, drill the holes in the new one and bolt everything back up again, Mike. Good choice mike, I think you'll see a world of difference in how it tows. Now it's learning how to load it to keep it balanced. Ok, I got the holes drilled for the new coupler but now I need to drill the mounting holes. They are bigger than any drill bit I have so I will need to go buy one. For those that added an extended tongue, do you recall the drill bit size I need? Undue one of the bolts and take it with ya! Take the old tongue and the new one to the metal shop and for a few bucks the probably can duplicate the hole pattern with ease. You will definitely find the long tongue better to pull. Well it looks like I have it fixed!!! Wooohooo!!! After inspecting the front, not only was the frame bent up a bit, it was also angled a little left. It was even more exaggerated with the longer tongue. The old tongue also didn't appear to appear quite square so either way, a new tongue was going to be needed anyway. I decided to go a little unconventional to try and straighten some of the frame problems. I used a 1 foot 2x6 piece of wood and a sledge hammer. I first put the old tongue back in place but left it unbolted. I used Monkeytruckers advice and put down the front jack stands first. I laid the 2x6 on top of the part where the "A" frame met the tongue and gave it a few hard whacks. That seemed to bring the level down. I then removed the tongue and placed the 2x6 inside the "A" frame on the right side and gave that a couple whacks and the tongue now was going pretty much stright forward. I put the new coupler on the new tongue and was able to easily drill the new holes for that. Then I needed to drill the mounting holes. I rested the new tongue on 2 2x6's and held the old one on top of that for a guide. I found out that a 1/2" drill bit is the exact size for those bolts... Except when holes are slightly off. Doh!!! The holes just needed to be slightly enlarged and then worked out perfectly. I did a couple coats of black rustoleum spray paint on it and then got it bolted back on with the new coupler now attached. (Since I was painting anyway, I cleaned up a few other spots that were missing some paint and threw a few coats on them as well.) Wires got extended and it was time for a test run. 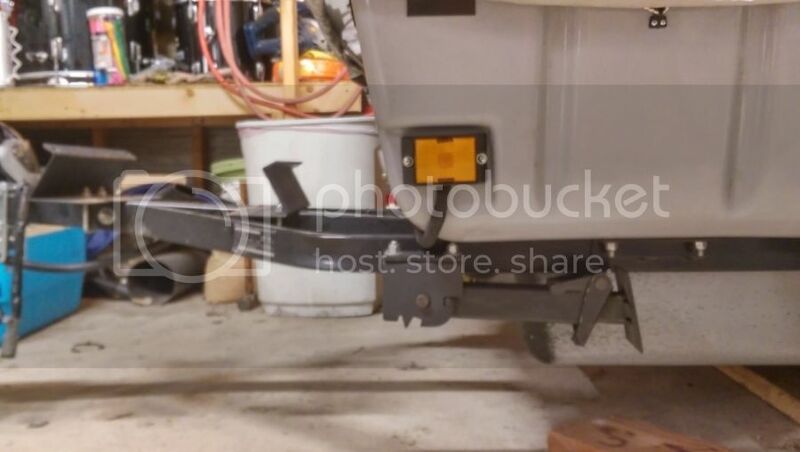 The 3" drop hitch seems perfect now because the camper sits pretty level so I won't bother going to the 6" drop. A check of the tongue weight showed it was at 23.9lbs. On the last trip, I was running 23lbs psi on the tires but bumped that up to 33lbs because the VIN sticker calls for 35lbs. I didn't have the trailer fully loaded so it was a bit bouncy over larger bumps but not enough to cause any issues. I also had previously done the GL1800 actuator fill fix and bumped my rear shock up to 25. It seems to track very nicely now. I also got out on a local highway and ran it for several miles between 70-80 and no wag at all. Cool!!! I even passed by numerous semi trucks and couldn't detect any problems. I think I am golden now. So I should be all set for the NAGW ILL M&G next weekend. Thank you to everyone for the suggestions. Just another example of how the well placed application of the BFH 16# can cure the largest of any problems. Years ago a body man used his hammers and dolly blocks and straightened all body panels and did it with pride. That is a lost art. Today it is just bolt on a new panel. By tomorrow those panels will come pre-painted. That reminds me of a used body parts supply house in Chicago that you could order your fenders, doors and other parts in the color you wanted. They went out of business when they got caught taking panels off of cars they did not own. Cool Mike just read this thread.glad you got it fixed. One thing i want to add just fyi is,I have had more than one of my racecars on a frame machine after a huge crash on the racetrack. the frame,or tube,where you think it was bent.Tap both sides of that tubing and when you let the pressure off it will stay right there.Then re weld the A support tubing.Most think ,just bend the steel PAST where it needs to be and it will spring back to straight.NOT the way to do it for the proper strength. Good post Mike! Glad you were able to fix it. The good thing about Aspen is they are so versatile and easy to work on, and if all else fails, parts are readily available from the manufacturer. Also watch your tires for center wear Mike with the added air pressure. Mine seem to wear good at 25 psi. Glad you're gettin it straightened out. I run mine at 25# as well. I have had even tire wear and have about 8000 miles on the tires now. I agree on the air pressure.That's about what i run because i noticed the center thread wearing a bit and lowering pressure solved that problem. 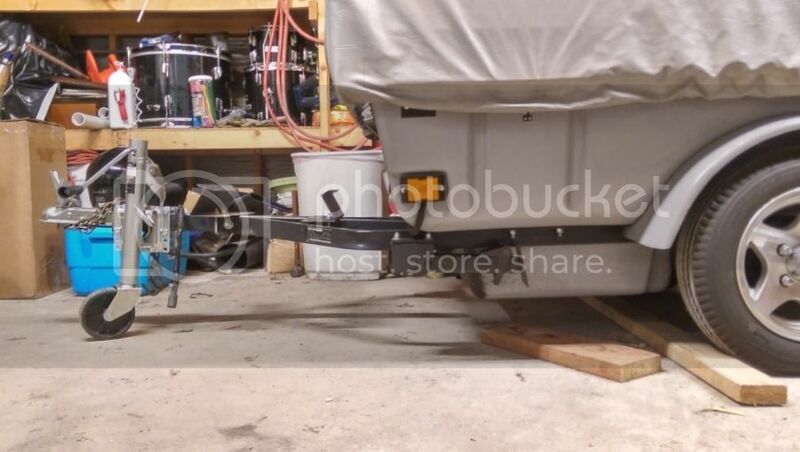 Now the HF cargo trailer i built and pulled on a 24 day trip out west,i tried EVERYTHING to try and make those cheap azz tires wear HALFway decent and couldn't. I have gauges i align my race car with and used those on that trailer to make sure it tracked proper.By the time we got to the house both of those tires were JUNK. Only got 4700 out of them.I did have it loaded heavy to the max,but i got a pic riding 2up in a long curve with no hands running Eighty Five.It tracks perfectly. I blame it on JUNK tires because my Aspen tires are still like new.